The Case Handyman & Remodeling opportunity fills the much needed demand for home repair and improvement with professional services. Case not only fulfills the small project need, but also offers its franchisees the ability to handle the demand for larger scale projects. As a result, homeowners come back to Case for all their home improvement needs again and again. 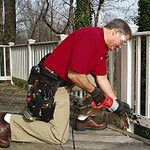 Case has beyond a doubt become the leader in the home improvement business. In fact, in 2003 Qualified Remodeler magazine, a leading industry publication, recognized Case as the leading full-service remodeler in the country. Many of Case’s key personnel are relied on in the industry for their advice and guidance on best practices and insights on the future direction of the industry. And as a part of the Case Community, you have first-hand access to this information. This is an exciting time to be a part of this handyman business and there is no one better to be enjoying the ride than with Case. We’re looking for additional strategic business partners to help grow our brand. Our ideal candidate is a person who is familiar with, involved in or passionate about our industry as a means to help them improve their income and lifestyle while building wealth and equity. Our best performers love the business, implement the operating systems, and are driven by personal goals. If the checklist below describes you, then you may be ready to learn more about our franchise opportunity. • I aspire to be a part of and grow a team. • I have a strong desire to build a client base and to help people. • I am interested in improving my lifestyle by using a company’s business systems. • I am familiar with and have a passion for the industry. • I have already decided to take a new path. • I want to make my dream a reality. While our industry may be home improvements, we are truly in the “people business”. We are a “client-centric” organization with those we work with our top priority. We have serviced over 100,000 clients nationally, are in over 2,000 homes a week, have a “very satisfied” client satisfaction rating of over 90%, enjoy 65% of our sales volume coming from previous clients, and 25% of our client base consists of repeat clients. We are looking to bring a select group of franchisees into our system. If it’s the right time for you, our mutual decision making process will allow you to decide if our opportunity will provide you with what you are looking for and us to ensure that you are the right candidate for our franchise community.